On Stardate 41723.9, DaiMon Bok of the Ferengi Alliance attempted to misrepresent Jean Luc Picard’s actions at the Battle of Maxia to embarrass the Federation, while destroying the career of the good Captain in the process. By using a Thought Maker, Bok was able to erode Picard’s grip on reality and get him on board his old ship, The U.S.S. Stargazer – which Bok had just conveniently presented to the Federation as a gift, together with tampered logs blaming Picard for the deaths of the Ferengi at Maxia. Then, using the Thought Maker, Bok turned Picard against his own ship and crew, and but for the positronic cunning of Commander Data, all would have been lost. 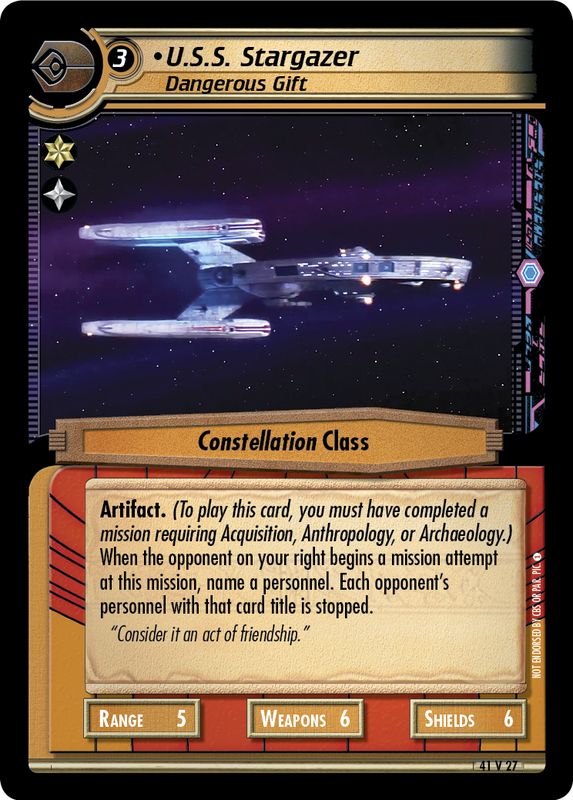 Finally, Star Trek CCG Second Edition has cards representing the events depicted in TNG Season 1 episode, "The Battle." Allow me to introduce Jean Luc Picard, "Hero" of Maxia; and the U.S.S. Stargazer, Dangerous Gift. Proposed as part of the "pushing limits" theme, the Ferengi JLP adds a third Human to the Ferengi’s list of personnel, and a personnel with 2 Navigation and Integrity >7, both firsts for the Ferengi. But, the real value in the orange JLP is that he allows the Ferengi player the ability to make use of those cards just sitting under his or her Ferenginar. Just as Picard’s headaches and hallucinations consumed the human resources of the Enterprise’s crew, so too will this Picard force an opponent to commit more human resources to completing a mission. Likewise, the Stargazer becomes the first ship to bear the Artifact keyword. But, more importantly, this ship and her commander open up a new interference strategy for the Ferengi player. 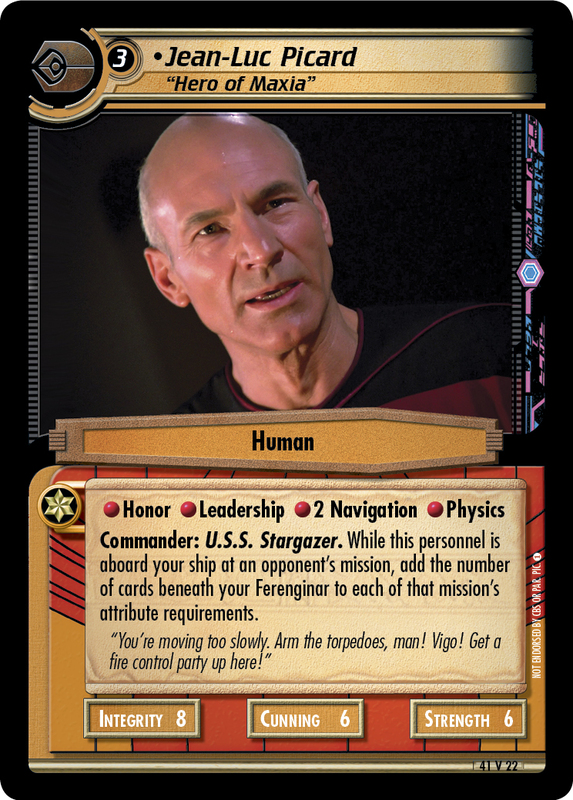 Put JLP aboard his Stargazer at an opponent's mission and they become dangerous indeed, allowing the Ferengi player the ability to stop a personnel at that mission (or up to three in the case of non-unique personnel) and simultaneously make that mission just a little harder to complete. Completing a mission requiring Acquisition should be no bother, but Commandeer Prototype could also be used by Cardassians, Klingons, or Romulans (or the Ferengi, for that matter) to get the Stargazer into play. While both of these cards went through some modifications, they are still true to their original intent. Will you use the pair to stall your opponent at a needed mission while you go on to acquire victory? Or, given his 3-cost for good skills, attributes and a command star, will you use JLP to help you complete missions? Maybe you’re thinking of putting a copy of the Stargazer, paired with Commandeer Prototype, in your Romulan interference deck? I must confess that these cards have me thinking about whole new deck types to build. We hope they’ll inspire you too.